Chlamydia sequelae cost estimates used in current economic evaluations: does one-size-fit-all? Background Current evidence suggests that chlamydia screening programmes can be cost-effective, conditional on assumptions within mathematical models. We explored differences in cost estimates used in published economic evaluations of chlamydia screening from seven countries (four papers each from UK and the Netherlands, two each from Sweden and Australia, and one each from Ireland, Canada and Denmark). Methods From these studies, we extracted management cost estimates for seven major chlamydia sequelae. In order to compare the influence of different sequelae considered in each paper and their corresponding management costs on the total cost per case of untreated chlamydia, we applied reported unit sequelae management costs considered in each paper to a set of untreated infection to sequela progression probabilities. All costs were adjusted to 2013/2014 Great British Pound (GBP) values. Results Sequelae management costs ranged from £171 to £3635 (pelvic inflammatory disease); £953 to £3615 (ectopic pregnancy); £546 to £6752 (tubal factor infertility); £159 to £3341 (chronic pelvic pain); £22 to £1008 (epididymitis); £11 to £1459 (neonatal conjunctivitis) and £433 to £3992 (neonatal pneumonia). Total cost of sequelae per case of untreated chlamydia ranged from £37 to £412. Conclusions There was substantial variation in cost per case of chlamydia sequelae used in published chlamydia screening economic evaluations, which likely arose from different assumptions about disease management pathways and the country perspectives taken. In light of this, when interpreting these studies, the reader should be satisfied that the cost estimates used sufficiently reflect the perspective taken and current disease management for their respective context. A recent literature review commissioned by the European Centre for Disease Prevention and Control (ECDC) reported that 9 out of the 10 studies included in the review found at least one screening strategy to be cost-effective.3 However, results of chlamydia screening cost-effectiveness analyses are influenced by the type of mathematical model used for the analysis, as well as the assumptions and parameters used in the model. Key influential assumptions revolve around the natural history of chlamydia disease progression, sexual behaviour and health economic inputs. The latter encompasses costs of screening, as well as costs saved and quality-adjusted life years (QALYs) gained from chlamydia infection and sequelae averted as a result of early detection and treatment of infection. All these economic parameters play an important role when estimating cost-effectiveness of screening programmes. Differences between mathematical models in terms of their structure and assumptions regarding the effectiveness of chlamydia screening and the natural history estimates have been previously explored,4–6 and more recently, Jackson et al7 highlighted the poor quality QALY evidence used in chlamydia models. 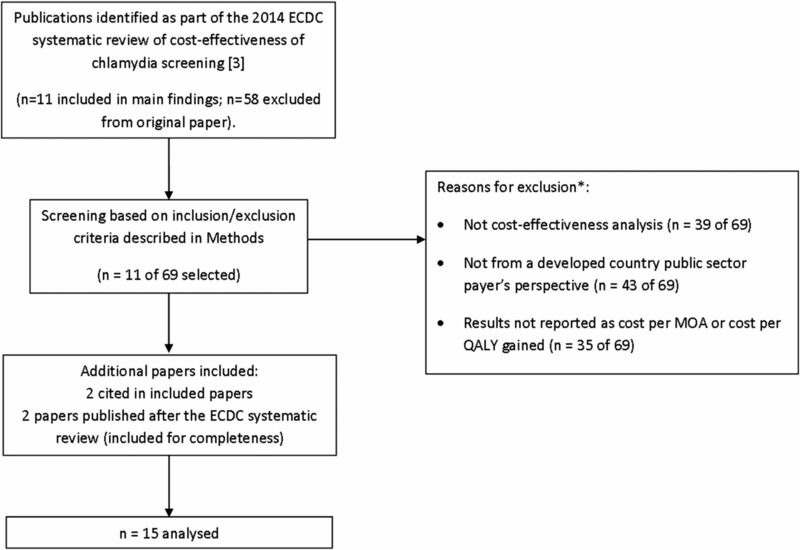 However, no paper has yet investigated the cost parameter estimates used in chlamydia screening cost-effectiveness analyses. In this paper, therefore, we compare cost estimates used in cost-effectiveness analyses and explore the potential effect of variations in these inputs on the resulting differences in the estimated cost per major outcomes averted (MOA) or QALY gained. Papers were identified from the systematic review of cost-effectiveness of chlamydia screening published by the ECDC.3 We considered for inclusion in our study both papers included in the main findings of the review (n=11) and those initially identified, but subsequently excluded from the ECDC review (n=58, additional references provided courtesy of the authors of the ECDC report). The inclusion criteria for our analysis were that the papers (1) evaluated the cost-effectiveness of different chlamydia screening strategies in populations of a developed country; (2) used cost estimates for chlamydia sequelae from the perspective of a public sector payer such as a national health service or universal public/statutory health insurance system, that is, excluding societal costs, out-of-pocket payments and private insurance, as private payments are likely to differ significantly at the individual-level;8 (3) reported results as either cost per MOA or cost per QALY gained and (4) presented at least one individual chlamydia sequela management cost. Publications that included screening for other sexually transmitted infections as well as chlamydia, but where independent evaluation of chlamydia-only screening was not possible, were excluded. Foreign currencies were converted to GBP using historical rates of the Bank of England average exchange rates against Pound Sterling, for the relevant year.10 Costs were then inflated to 2013/2014 GBP values using the Hospital and Community Health Services index.11 None of the costs were discounted, as we did not consider time to event in the unit cost comparison. To enable us to have an overall picture of the potential impact of difference in the sequelae considered and their associated costs on the cost-effectiveness analysis findings, we calculated the total estimated cost of managing chlamydia sequelae per case of untreated chlamydia. This was done by applying the unit cost of managing the corresponding sequela reported in the various papers to a set of standard probabilities of progression from untreated chlamydia infection to each sequela. Probabilities of progression were obtained from Adams et al,12 apart from CPP, low birth weight and, postpartum endometritis, which were not considered by Adams et al. For CPP, the average value from several papers13–19 was used. Low birth weight and postpartum endometritis were obtained from Ong et al,20 as they were only considered in this paper. In addition, pregnancy rate (applicable to neonatal complications) was age-specific in Adams et al,12 so we referred to the 5% reported in Norman et al13 for an overall estimate (table 1). We also calculated the cost of each individual sequela as a proportion of the total cost of managing a case of untreated chlamydia infection in each reviewed paper. This allowed an appreciation of the impact of inclusion/exclusion of different sequelae on the total estimated cost of managing untreated chlamydia and thus the costs that could theoretically be averted by screening followed by effective treatment. Eleven published papers identified through the ECDC searches were selected for inclusion in this analysis. Three papers were from the UK (two from an English perspective,12 ,21 one from a Scottish perspective13), two from the Netherlands,14 ,22 two from Sweden15 ,23 and one each from Australia,24 Ireland,25 Denmark26 and Canada.27 One22 of the 11 papers selected cited sequelae management costs from previously published papers, so the latter two papers were also included.16 ,17 For completeness, two more recent papers, one by Looker et al,28 evaluating cost-effectiveness of chlamydia testing in Scotland, and the other by Ong et al,20 from an Australian perspective, were also included in our analysis (see figure 1). Identification of papers for inclusion in the comparative analysis. Note: *sum of papers excluded based on the reasons presented here is higher due to some papers having more than one reason for exclusion (ECDC, European Centre for Disease Prevention and Control; MOA, major outcomes averted; QALY, quality-adjusted life year). Cost data were extracted from these 15 papers, all of which considered PID as chlamydia-related sequelae. EP was considered by 13/15 papers,12–17 ,21–27 TFI by 14/15,12–17 ,21–28 CPP by 9/15,13–17 ,22–24 ,26 epididymitis by 12/1512–17 ,21–23 ,25–27 and neonatal conjunctivitis/pneumonia by 11/15.12–17 ,21–23 ,25 ,26 The paper by Ong et al,20 which evaluated antenatal chlamydia screening, also considered low birth weight and postpartum endometritis. As shown in figure 2 there was considerable variation in the reference case cost estimates for each sequela used among the papers considered. The management cost per case of PID diagnosed ranged from £16328 to £3635.21 Eight12 ,14–17 ,20 ,23 ,24 out of the nine papers with details on PID cost estimation considered 70%–100% treatment in outpatient settings. Details of components included in each management pathway are provided in the online supplementary material. In the case of PID, one paper21 considered inpatient care only in their reference case, in an attempt to estimate the limits of cost-effectiveness of chlamydia screening. The management cost per case of EP ranged from £95312 to £3615.13 In the three papers that had further breakdown of information about how costs were estimated,12 ,15 ,16 two considered management in inpatient settings only,12 ,16 and treatment was either using drug or surgery. None considered management by observation. 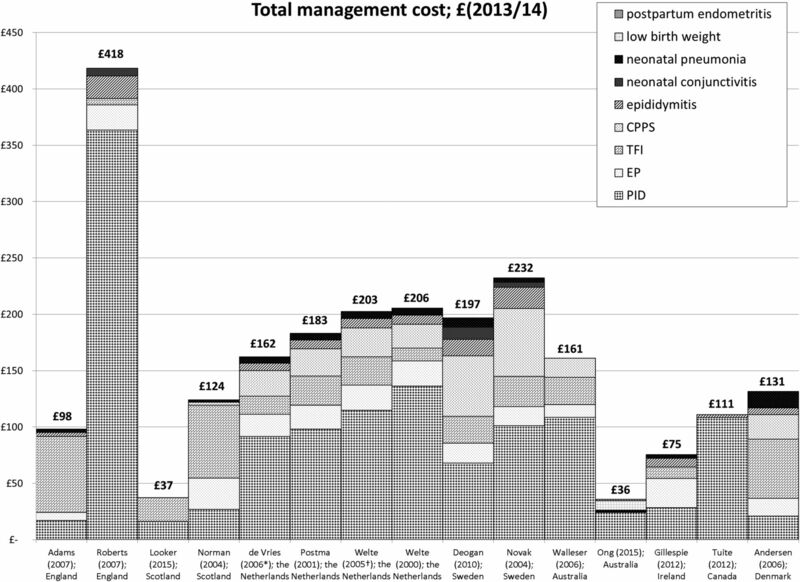 CPP syndrome management costs were in the region of £1000–£3300, except for one paper13 that used a cost of £159. Four of the papers15–17 ,24 with detailed cost estimation considered between 4 and 10 outpatient visits, either with the primary care physician or gynaecologist; all four papers assumed that 30% of patients received inpatient care. Epididymitis management costs were mostly within £1000, with some variations. Management costs were in the region of £150–£400 in 8/12 papers.12 ,14 ,16 ,17 ,22 ,25–27 Cost was £21 in the paper from Scotland,13 and £1000 in one paper each from England21 and Sweden.15 Most of the studies with detailed breakdown on cost estimates considered 85%–90% management in outpatients. However, even when the type and amount of care given were similar, estimated costs varied substantially. For example, Roberts et al21 and Welte et al16 both considered 85% outpatient management that included two specialist appointments. However, the cost estimated in the former was more than twice higher than in the latter. This difference may be due to different lengths of inpatient stay, which could not be ascertained as Roberts et al did not report the number of hospital days per inpatient episode. Difference may also be attributable to other factors such as intercountry variation. It was not clear why the cost was much lower in the paper from Scotland,13 as no details were given. Management costs for neonatal conjunctivitis were below £100 in most studies, except in the Swedish papers.15 ,23 It is of note that Novak et al15 stated that they included the cost of management for the mother and her partner. In relation to neonatal pneumonia, management cost was below £1000 in papers from the UK,12 ,13 Ireland25 and one paper from Australia.20 Cost in papers from the Netherlands14 ,16 ,17 ,22 was around £1500, and was highest in the paper by Andersen et al26 at £4000. No further information was available about the component costs contributing to this high estimate. Figure 3 shows the total cost to manage chlamydia sequela per case of chlamydia infection when the unit costs were applied to the standard set of progression probabilities. Estimates used in Roberts et al21 resulted in the highest total chlamydia sequelae management cost (£412). Looker et al28 had one of the lowest total cost (£37), partly because they have only included two major sequelae in their model (PID and TFI). The total cost estimated using unit costs from Ong et al20 was the lowest (£36), mainly because this paper considered antenatal chlamydia screening and only included sequelae affecting the women screened and their newborn, occurring within a 12-month period. When subsequently applied to the total cost estimates, most of the sequelae (neonatal complications and postpartum endometritis) were only applicable to the 5% pregnancy rate. 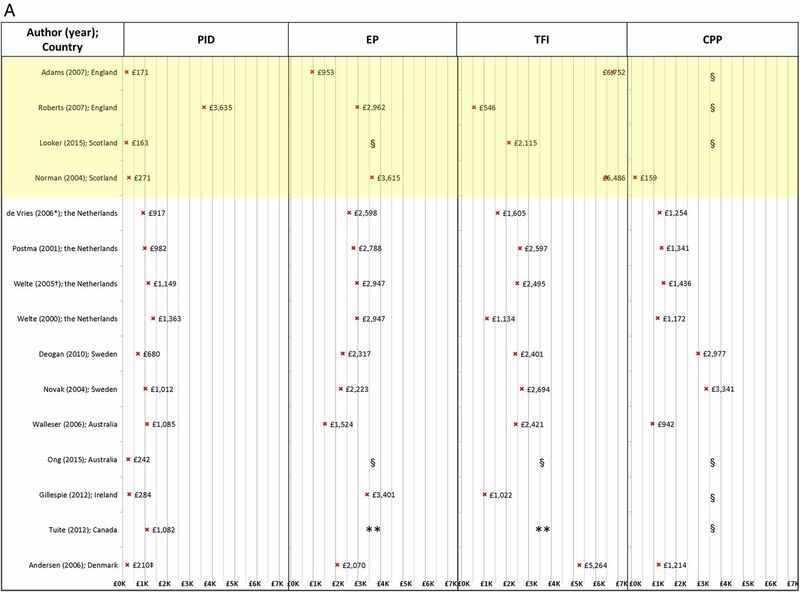 Figure 3 also shows that, when using a standard set of progression probabilities, PID contributed most of the management cost per case of untreated chlamydia in 11/15 studies, while TFI contributed most to the remaining four studies. To our knowledge, this is the first paper to provide a detailed analysis of the unit costs of management of chlamydia sequelae used in economic evaluations of chlamydia screening programmes. We examined a range of studies from different country perspectives. By applying a set of standard progression probabilities we were able to explore the overall impact of differences in management costs on the total cost of managing untreated chlamydia infections. However, our study has some limitations. We only compared point estimates of the reference case sequelae management costs; ranges or probability distributions reported in some studies were not considered because of the wide heterogeneity in the way these were presented. For this reason, we did not examine whether differences between estimates were statistically significant, although the large variation in the point estimates strongly suggest this to be the case. In addition, the cost comparisons done did not account for timing of sequelae, which may have implications on costs due to discounting. The impact of discounting is such that it will decrease future costs, so if a sequela is expected to occur much later, then even if it has the same undiscounted cost as another sequela that happens earlier, the present value of managing the sequela that happens later will be much lower because it is estimated to occur further into the future. An additional limitation is that we used a standard set of progression probabilities. We used a pragmatic approach by choosing to use progression probabilities for sequelae considered by Adams et al,12 as this paper is the most recently published economic evaluation on opportunistic chlamydia screening that have been applied to the context of the English National Chlamydia Screening Programme. If progression probabilities were different, the cost to manage individual sequela, as well as the total cost to manage sequelae, will be different. We did not compare costs of the chlamydia screening test or treatment of acute infections used in the various cost-effectiveness analyses as our analysis was restricted to costs of managing chlamydia-related sequelae. However, it should be noted that these costs play a vital role in the overall cost-effectiveness calculations. For example, the cost per positive chlamydia test reported in Gillespie et al25 was around five times that reported in Adams et al12 when both were adjusted to 2013/2014 GBP, the former of which found chlamydia screening to be highly unlikely to be cost-effective. We have not compared management costs against gross domestic product per capita, as the final cost for each sequela is a combination of purchasing power and assumptions made with regard to patient management pathway. For tradable goods, currency exchange rates are likely to be sufficient for conversion. However, there will be intercountry variation in healthcare management costs.8 This means that management costs from the Netherlands for managing an episode of PID in the general practice setting, for example, may not be directly translated to the English setting. Moreover, older cost estimates, even from the same county, would not reflect advancements in medical management of diseases since their publication. For example, the management landscape for EP has changed over the years, with earlier diagnosis enabling some patients to be managed successfully with watchful monitoring alone, and others treated with methotrexate/surgery.32 ,33 Watchful monitoring was not considered in the papers that had detailed cost breakdown. These changes to the management pathways due to advancement in medical management need to be taken into account in any future cost-effectiveness analyses. The large variation in unit costs demonstrated in our study highlights the challenges of cost estimation, especially when disease management pathways are themselves complex. For example, TFI, where diagnosis is dependent on a patient's desire to become pregnant, while treatment options are dependent on the severity of tubal damage as well as funding options and availability of treatment. Some of the cost estimates did not reflect the full management pathway from TFI diagnosis, through to treatment based on severity of tubal damage.34 For instance, Roberts et al21 only included one cycle of treatment, but did not state whether costs for diagnosis was incorporated. Even when more complete management pathways were considered, there were differences in other assumptions. Looker et al28 set the cost to one cycle of IVF, based on the justification that although more cycles may likely have been funded in those diagnosed and received IVF treatment, but they have not adjusted for the fact that not all individuals will received IVF, which will in turn lower the overall cost of IVF. While it was clearly outlined in Adams et al12 that they have considered half of the patients affected to be diagnosed and treated, treatment of which may be tubal surgery or IVF. Although the evidence base for the progression of CPP from chlamydia infection is poor,6 this sequela was considered in 9/15 papers. On the other hand, only one of the publications included in the current analysis considered low birth weight and postpartum endometritis, both of which have, again, limited current evidence of their associations with chlamydia.35 ,36 Future research will be needed to ascertain whether there is a lack of association with chlamydia infection, or a lack of evidence of association. If it is the latter, it would be worth considering for inclusion in sensitivity analysis. For epididymitis, neonatal conjunctivitis and neonatal pneumonia, their cost difference may have arisen from intercountry variation in healthcare delivery costs, or differences in the proportion of cases assumed to be treated in hospital settings, an area where more robust estimates may be lacking. Again, analyses should reflect cost estimates relevant to the perspective taken, although, their overall impact on the total cost of managing all chlamydia sequelae may be small given their lower progression probabilities. There is value for authors to be transparent and provide details about how the individual cost estimates were derived. In summary, our analysis demonstrates a need to exercise caution in interpreting chlamydia screening economic evaluations. When considering or applying the findings from cost-effectiveness studies, readers must be satisfied that the chlamydia-related sequelae considered, and their management cost estimates used in the analyses sufficiently reflects the perspective taken by authors of economic evaluations, as well as being suitable for the reader's individual context. Substantial variation was observed in unit cost estimates used per case of chlamydia sequela in published chlamydia screening economic evaluations. Not all economic evaluations considered all major chlamydia sequelae. In interpretation, the reader needs to be sufficiently satisfied that the type of sequelae considered and their associated costs are suitable for their evaluation perspective. We thank Nicola Low and Shelagh Redmond for provision of additional data from the European Centre for Disease Prevention and Control Chlamydia Control in Europe systematic review. European Centre for Disease Prevention and Control. Chlamydia control in Europe—a survey of Member States. Stockholm, 2014. European Centre for Disease Prevention and Control. Chlamydia control in Europe: literature review. Stockholm, 2014.
. International profiles of health care systems, 2013. The Commonwealth Fund, 2013. Merriam-Webster. Definition of sequela. Merriam-Webster, 2015.
. Unit Costs of Health & Social Care 2014. Personal Social Services Research Unit, Kent, UK, 2014. Ford. A shift from surgical emergency to non-surgical management of ectopic pregnancy. RCOG 2013. Hon. The non surgical management of EP. RCOG 2013. National Institute for Health and Care Excellence. Fertility: assessment and treatment for people with fertility problems costing report implementing NICE guidance. 2013.
. Chlamydia screening in pregnancy: an evidence review. UK National Screening Committee, London, UK, 2009. Contributors KJO designed the analysis, developed the methodology, collected the data, performed the analysis and wrote the manuscript. KS designed the analysis and commented on the methodology and manuscript. MJ commented on the methodology and manuscript. JKD commented on the manuscript. SCW commented on the methodology, the analysis and the manuscript.